Plato maintained that the best possible heads of government are philosophers. 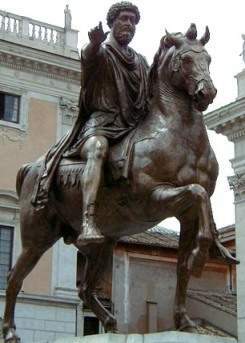 As emperor of Rome Marcus Aurelius was the most powerful man in the world yet he was motivated by a desire for virtue, justice and peace rather than money, possessions and fame. His writing has remained relevant for almost two thousand years because he wrote as a man not an emperor. He wrote about his fear, and his emotions, his sense of the fleetingness of life and the importance of living in and savoring the moment. In his attempts to keep balance and harmony he advises himself on topics such as hope, tolerance, self-sufficiency, change, harmony, discipline, reason, courage and man's position in the universe. Here are some profound quotes from Marcus Aurelius found in his work Meditations. They are full of beauty and wisdom. Discard everything except these few truths: we can live only in the present moment in this brief now. When you are disturbed by events and lose your serenity, quickly return to yourself and don't stay upset longer than the experience lasts; for you'll have more mastery over your inner harmony by continually returning to it. Despise not death, but welcome it, for nature wills it like all else. Do every act of your life as if it were your last. Look deeply. Do not miss the inherent quality and value of everything.